A Euro lurking about in the scrub. Wallaroos are macropods of a size between kangaroos and wallabies. 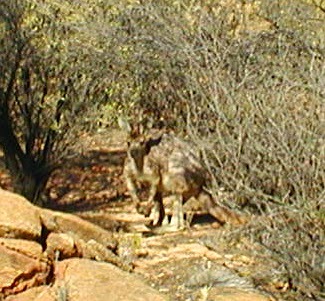 The outback sub-species is known as the Euro. Tracks made by Euros who have come down to a pool of water to drink. 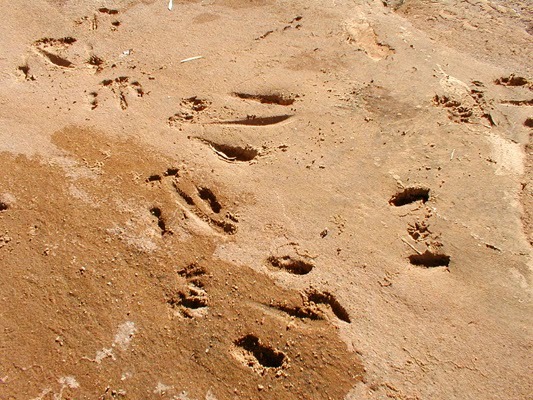 You can see the three types of tracks a slow moving macropod makes -- the imprint of the tail as it scrapes along the ground, the long toes of the hind feet and the tiny claw prints of the hands. Blogging Pause: Blogging may be a bit erratic over the next couple of weeks. We are recovering from a flu-like virus and are rather busy at the moment so blogging will depend on time, motivation and ones we prepared earlier -- all of which could be at a low ebb for a while. Au jardin hier: Yesterday the roofer François Galland and his foreman Yannick called at the house. Our neighbour has contracted them to sort out the chimney at the front of their house (hoorah! it has been dangerous for years...). They asked if we could move the pots in the front courtyard so they can have access to the chimney. I agreed happily, as the pots are due for a revision, so it's no real inconvenience to move them to one side. I did all the small pots and they will come and move the big ones on Monday when they start work. 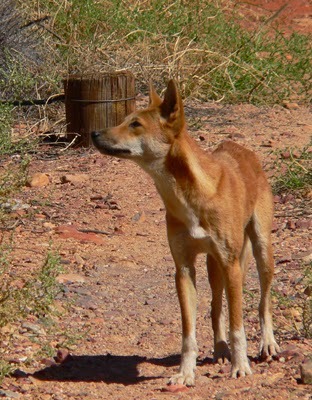 A beautiful dingo in the wild at Ellery Big Hole. Dingoes Canus lupus dingo are a separate sub-species of wolf Canis lupus lupus, and not descended from domestic dogs Canus lupus familiaris that went feral several thousand years ago. They can interbreed with domestic or feral dogs though and not all wild dogs in Australia are purebred dingoes. The one in the photo above is a fairly typical looking dingo, with characteristic ginger coat and white socks, but you do sometimes see black and tan ones. They don't generally bark, but if you are in the outback it is not uncommon to hear them howling at night. This one was clearly a little bit habituated to people, but hopefully was not being fed by campers in the area. That leads to them becoming a nuisance, with no fear of humans, and they have to be removed. 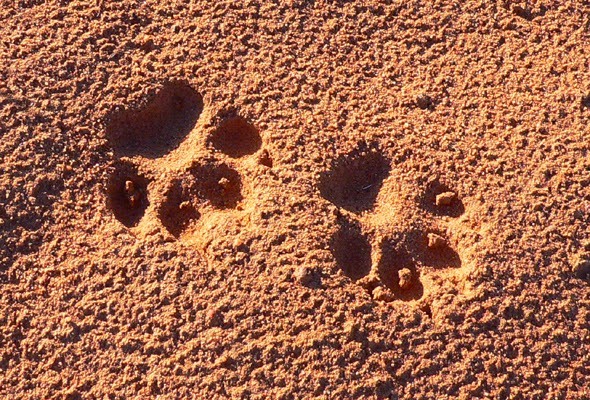 Dingo tracks in the sand. Ellery Big Hole is the name of a waterhole not that far from Alice Springs. It's a popular wild swimming destination. 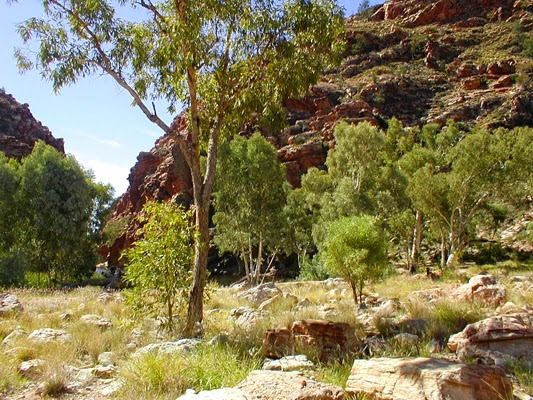 This photo is taken from the path to the waterhole, which is just visible as lush vegetation mid-left. Three day weekends when the only food consumed was toasted bacon and egg sandwiches, whilst travelling 1,800km with 4 people and a tonne of gear in a van or car and trailer. Long days and even longer nights. Regrets? None. Not to say that there weren't scary moments - like when the axle of the trailer broke at 100kmh at (well - near) Bollon on our way out to Eulo. All of a sudden the trailer had taken on a life of its own, and the trailer wheel was leading me down the road. Until that moment I was the only person in the car who was awake and as luck would have it - I was driving. So there we were, miles from nowhere. After finding and retrieving the wheel we sat by the car, waiting for someone to along. I think we waited about 30 minutes for the first car, who gave the drummer and singer a lift to Bollon. When there, they organised the service station owner to drive out to us with a trailer while they phoned the person who had booked us to say we were delayed. Typical: singer directs guitarist to find wheel while drummer rolls a dhurrie. Bass player documents action. Once everything was loaded on the second trailer we travelled back to Bollon where we stored the broken trailer and waited in the pub (bad luck - pub was open) while the drummer's uncle drove out to collect us and the gear. He was in a one tonne truck, so a combination of that and our car we completed the trip in time, set up, played for 5 hours, then slept - not surprising, as by that stage we had loaded and unloaded the equipment 4 times in 12 hours. player 1: "hmmm. It isn't heating up"
Player 2: "gosh. why do you reckon that is?" Player 1: "I don't know, but I am getting jolly bored"
Player 3: "what nozzle do you have?" Player 1: "ah, would you believe, I have the cutting nozzle on"
Player 3: "oh dear. And what is that metal thing by your jolly old noggin"
Player 1: "you mean the fuel tank?" All players (in unison): ! Once we had applied heat properly and the tow bar was straightened we drove back to Eulo, loaded everything on the borrowed trailer, then drove to Bollon where we unloaded everything, loaded the broken trailer on the borrowed trailer, reloaded all the gear, and drove home. Fully loaded at at Bollon. The pub was open. Again. This wasn't a typical weekend, because sometimes we didn't break anything. We did cover a lot of miles over the year, and always found something to laugh at. Do I miss it? Yup - although for the laughs and mateship rather than the loading and unloading of tonnes of speakers and amplifiers. I have written about when my family emigrated to Australia, and also about life in Sydney. Moving from Sydney to Canberra (a distance of about 200 miles) meant a train journey of about a billion-trillion hours (or 6 hours, depending on age), even though Dad had been flown to Canberra for his interview. The house we were given was a Riley-Newsum prefabricated house, built in Lincoln (England) and shipped to many parts of Australia, somewhat controversially. 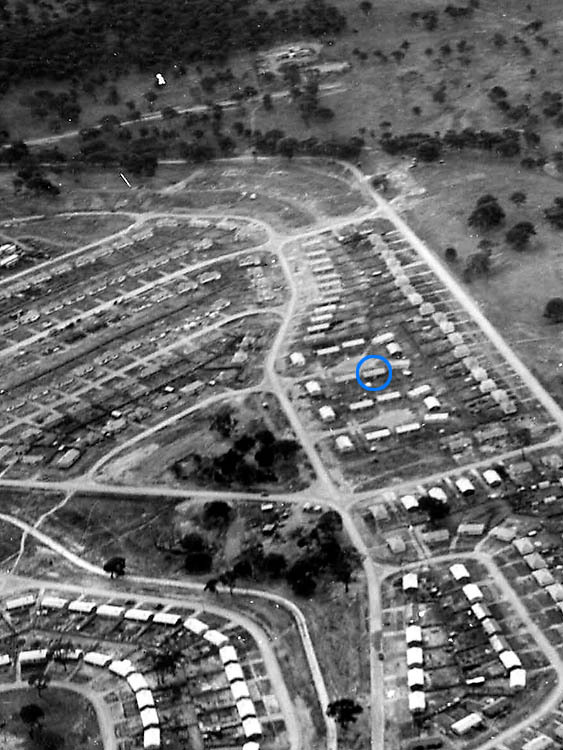 It had three bedrooms, bathroom, separate toilet, kitchen, laundry, dining room and living room, all set on 1/4 of an acre, and it was, without doubt, the bestest house I had ever lived in. In the above photo about half of the houses are exactly the same type. 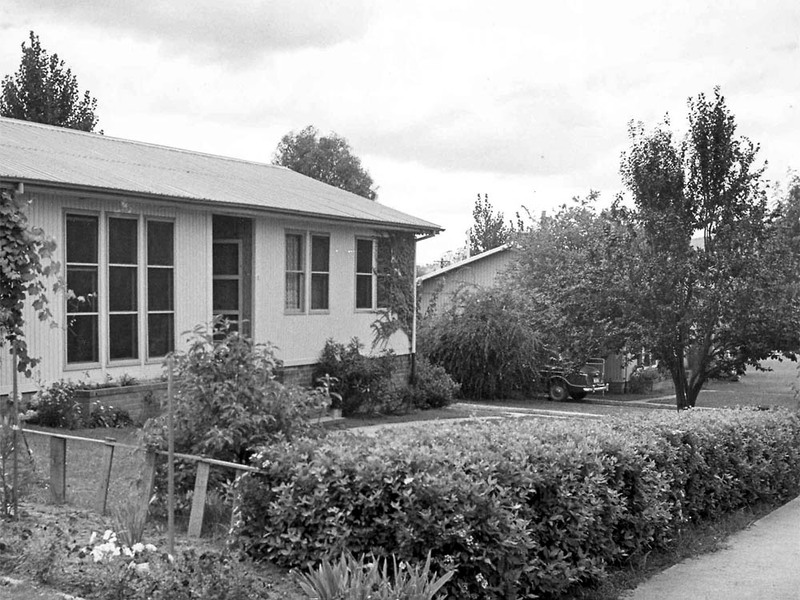 There are still some Riley-Newsum Houses still doing service in Canberra, 60 years later. the corner from where we lived. Here is a video about these houses, although the ones shown in the video were destined for Canada, not Australia. I do hope they were better insulated. 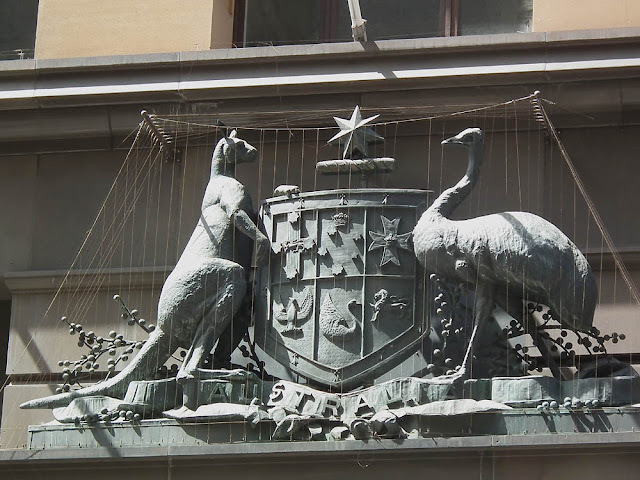 I am very pleased that those who wanted to use uniquely Australian animals rather than traditional heraldic beasts prevailed in 1908. Australian animals may be funny looking, but they are special, and anyway, heraldic lions always look gormless. Behind the animals are sprigs of wattle Acacia (known as mimosa in France), Australia's national flower. In the middle is a shield with the emblems of each of the states. This representation is on the Commonwealth Bank building in Martin Place, Sydney. We are using this photo today not because it has snowed, but because it hasn't. In fact, it last snowed here on January 25th 2013. That's two years without any snow at all - not a single flocon. To my mind, this is a rareity. 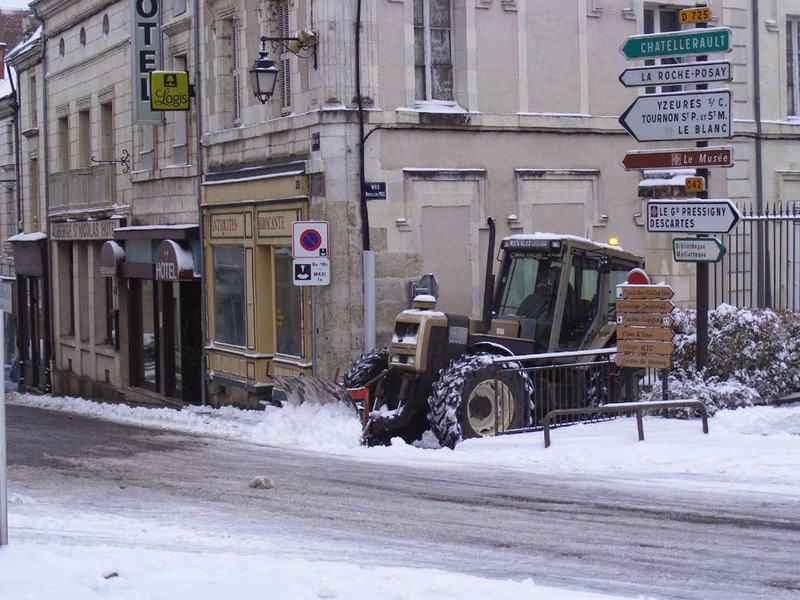 Although it is really difficult to discover what the longest snow free period is, we have been told that last year was the first time in 30 years it didn't snow in Paris, and when we bought our house we were told it snows every year even if it doesn't settle. We did make it to Preuilly's retraite aux flambeaux, even if we didn't tell anyone about it at the time. Medieval buildings: check. Flaming torches: check. And samba - of course. 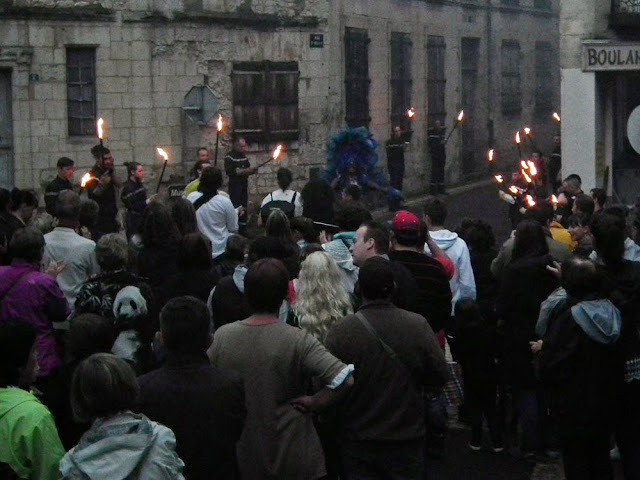 As is customary, the townfolk gathered outside the Mairie at dusk, followed the pompiers and their flaming torches on a walk around town, and ended up with fireworks and a dance at the plan d'eau. 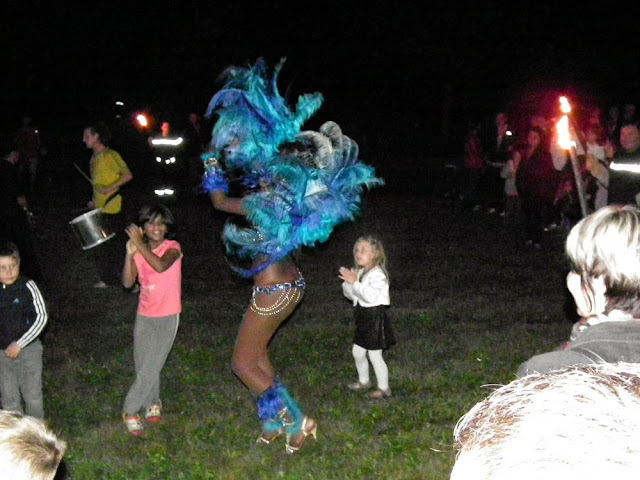 A few people weren't there because the World Cup Final was being played that night, but those of us who did attend were treated to a proper samba dancer in blue glitz, feathers and a whole lot of shakin', along with the flames and drums. Those who went on the retraite aux flambeaux didn't miss anything in the World Cup, either: the town had set up a TV projector at the plan d'eau, and we all arrived just as the final whistle blew. And hence before the goal. Fireworks were delayed until after the game finally finished, and for those not watching football (foot, soccer whatever you call it in your neck of the woods) there was an impromptu samba lesson. 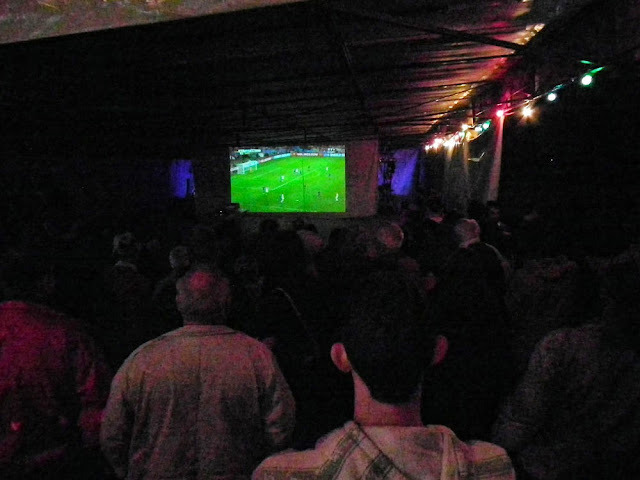 A tent full of French people cheering for Germany. 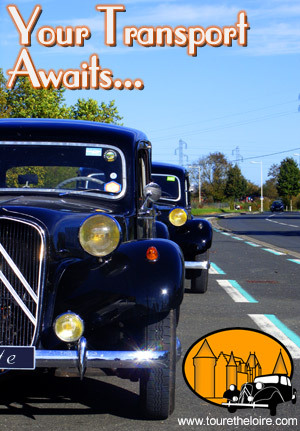 If you have never been to a retraite aux flambeaux and live near Preuilly, do consider a visit. It's worth the effort. 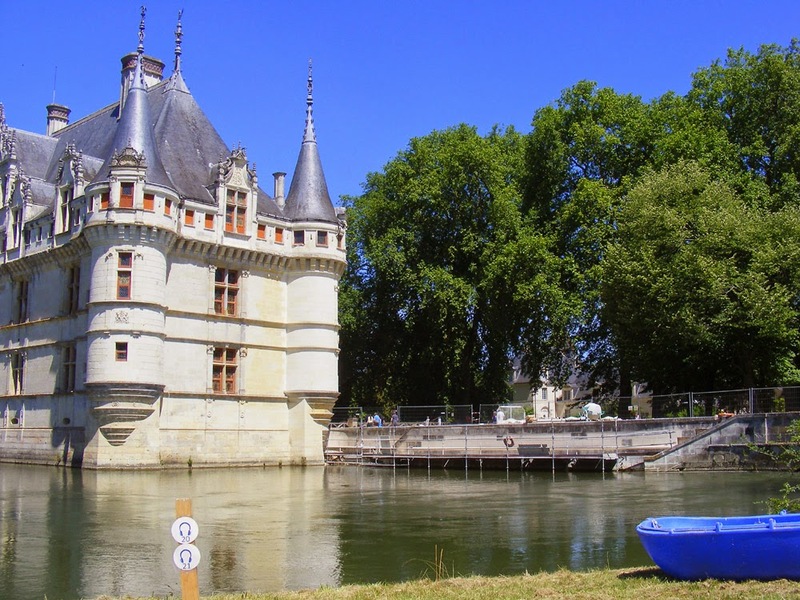 This year a three year programme to restore the roof and facades of the Chateau of Azay le Rideau begins. 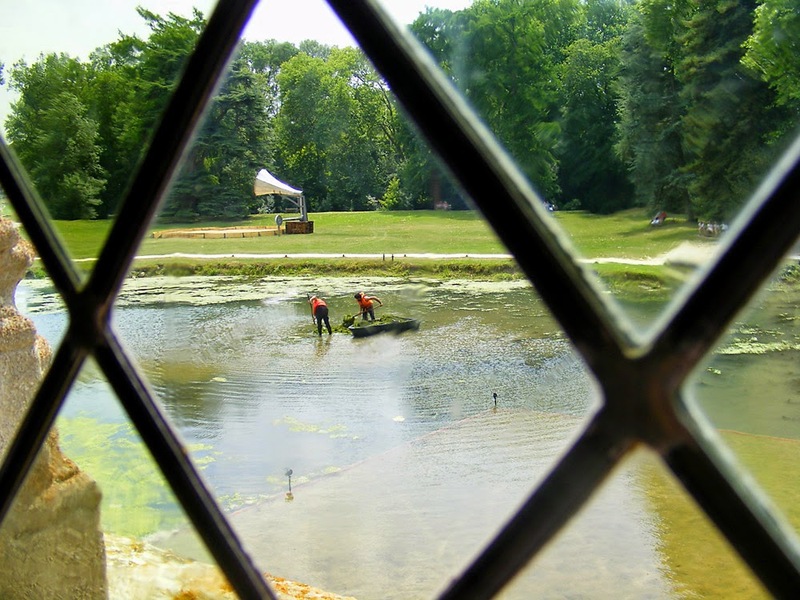 It follows the two year long restoration of the park back to its 1855 'English landscape' style. Restoring the terrace wall by the mirror pool. In 2013 the Centre des monuments nationaux, who own and run the chateau, chose to invest nearly €15 million over the period 2013 - 2017 to improve the site. The first part of this restoration was the 7 ha park, classified as a National Monument in 1907. The restoration was based on an 1855 plan of the domaine and will allow the visitor to experience the parc paysager à l'anglaise. 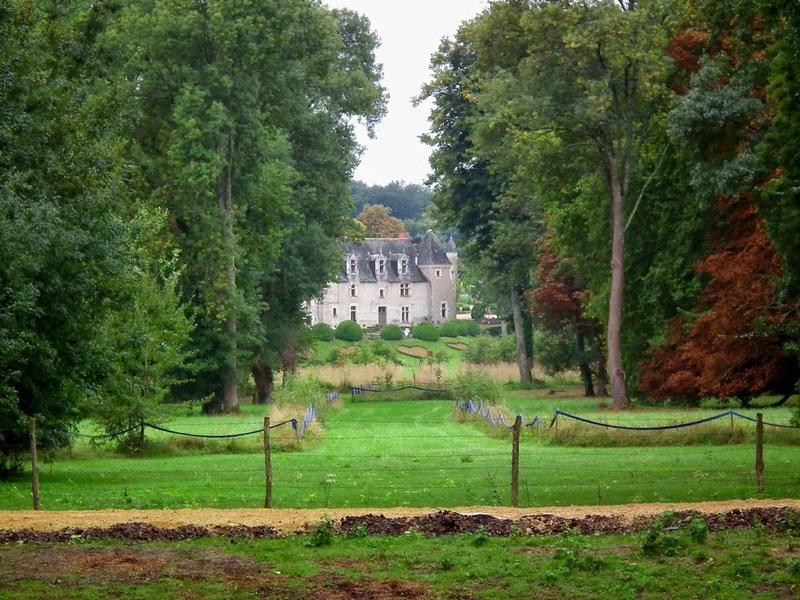 Looking down the stream to the chateau on its island. The soil has been improved and paths stabilised, facilitating disabled access. The opportunity to install cables and pipes for lighting and watering systems was taken while the ground was being dug up. The water for the irrigation will be extracted from the river. Paths will be lit by a network of lights along the edges. Looking at the front of the 16th century chateau from the main gate. As you emerge from the visitor centre you will be confronted by a massive bed of hydrangeas. On the lawn in front of the chateau the grass has been re-sown and will feature seasonal patches of brightly coloured daffodils, irises, tulips and perennials. The gardeners will only cut the grass three or four times over the season. The garden will be maintained without the use of pesticides. Numerous trees were coming to the end of their life and have been removed. They've been replaced based on the planting scheme shown in the 1855 plan. Four species of walnut have been planted, including a Black American Walnut, as well as Ash, Elm, Pagoda Tree and others. The foreground of this view has been improved since this photo was taken several years ago. The former kitchen garden of the Biencourt family will become a conservatoire of heritage Touraine vegetable varieties, cutting garden, scented garden and butterfly garden. L'île de la Rémonière will become an auxiliary space, from now on accessible by a foot bridge. Situated on the other side of the Indre it offers a new angle on the chateau. It's classified as a Natura 2000 nature reserve and allows visitors the possibility of seeing rare and protected plants and animals. Clearing the mirror pool of algae in the summer. Now the work on the park is finished everyone is looking forward to how splendid the new park will look in the spring, even if the building is swathed in scaffolding. A la cuisine hier: Macaroons, of the sort Henri II might just about have recognised, rather marzipany, not the rainbow ganache filled puffs you see in pâtisseries today. I made three batches -- plain coconut, cranberry, and ginger and coconut. The plain ordinary ones were the best. One of Simon's Shepherd's Pies from the freezer followed by rhubarb from a jar and homemade custard. Changed Traffic Conditions: The signs went up today to block entry to the top of our street. Milliseconds after I took a photo of the new signs showing no entry and one way, someone sailed past me and the no entry sign in a 4 wheel drive and went down the street in the now forbidden direction. Last year we spent a week in Paris with our friend Liselle and one of the things we did was visit the Gobelins tapestry factory. 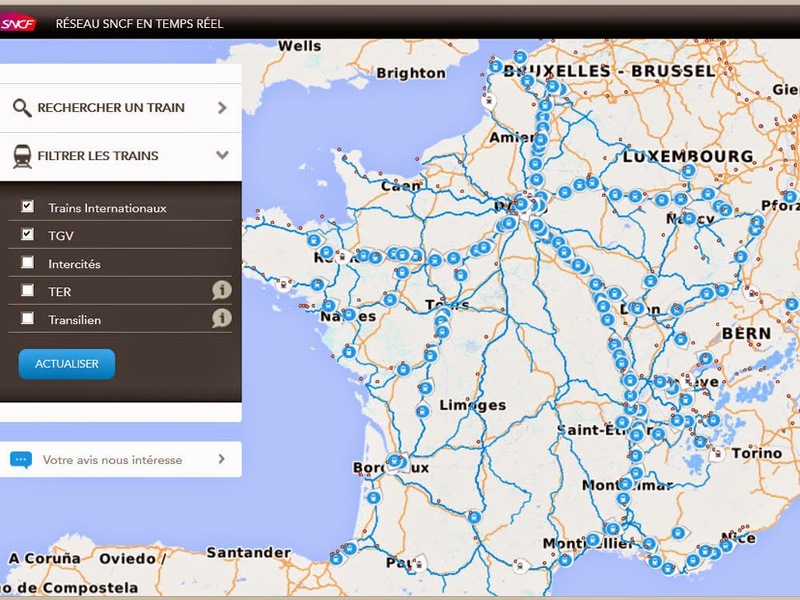 It is an absolutely fascinating visit, but only available as a guided tour in French. I've never written about it because it is forbidden to take photos inside the factory buildings or even to talk while in the workshops, in case you disturb the weavers who need to be totally focused on their painfully slow work. However we did take a few photos of the exterior, including photos of statues of the two men who were the driving force behind the factory. 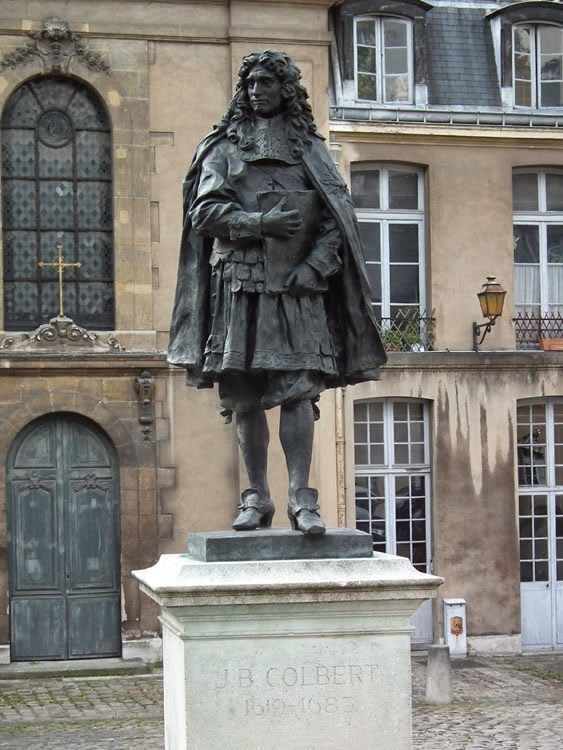 Jean Baptiste Colbert was Finance Minister to Louis XIV for nearly 20 years. Under his influence the French crown set up, funded and supported a number of manufactories specialising in luxury goods. They remain the bedrock of France's reputation for beautiful high quality decorative arts and remain in the hands of the French State. The Gobelins Tapestry Manufactory is probably the best known of these luxury goods workshops. It continues to produce tapestries to this day and guards the legacy of the artform in France by training not just weavers but curators and conservators who are available for consultation by museums and historic houses whose collections include tapestries. Charles Le Brun was the first director of the factory. He was already a well known artist when offered the position and remained attached to the factory for more than 25 years as both superintendent and chief designer. He is largely responsible for the interior decorating style known as Louis XIV. Naturally his hand can be detected at Versailles and both he and Colbert were incredibly productive workaholics. Loire Valley Nature: A new entry for Eurasian Glow-worm Lampyris noctiluca has been added. A photo has been added to the Grape Hyacinth Muscari neglectum entry. A photo has been added to the Roadside Verges, Ditches and Banks habitat entry. Photos of a Hummingbird Hawk Moth Macroglossum stellatarum nectaring at a Fragrant Orchid Gymnodenia conopsea have been added to both species entries. It was recently announced that the population of Indre et Loire has crossed the 600 000 mark. This figure is described as an official estimate, as the figure at the last census, in 2012, was about 3000 people short. A typical street scene in Preuilly. 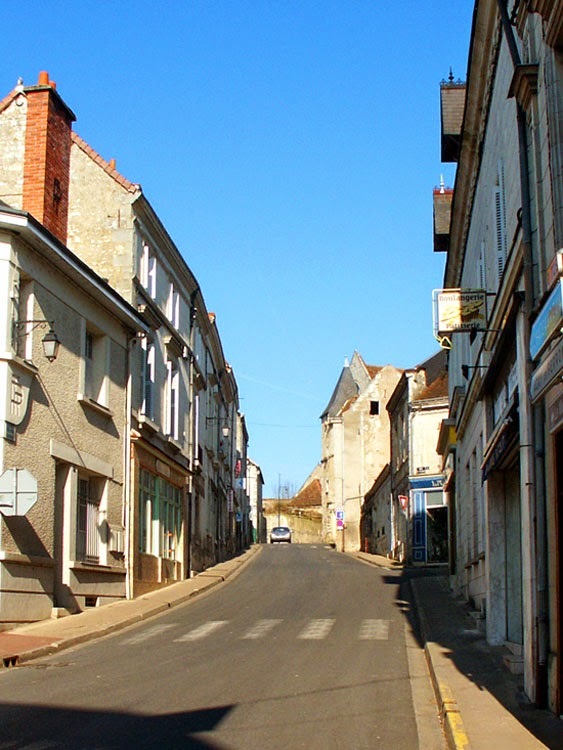 Preuilly's population has declined by 2.51% and is now 1048. To our west, Boussay's population has increased by 8.71% and is now 262 people. To the east Bossay sur Claise has declined even more than Preuilly and is down 3.4% to 796 people. To check out all the communes click on this link. Visitors often ask where all the people are in French villages. The answer is a) many of them are elderly and don't go out much; b) the total population and population density in these places is very low; and c) they are at work in one of the larger towns and commute. The population of Tours is now 135 218, down a bit from the previous census. 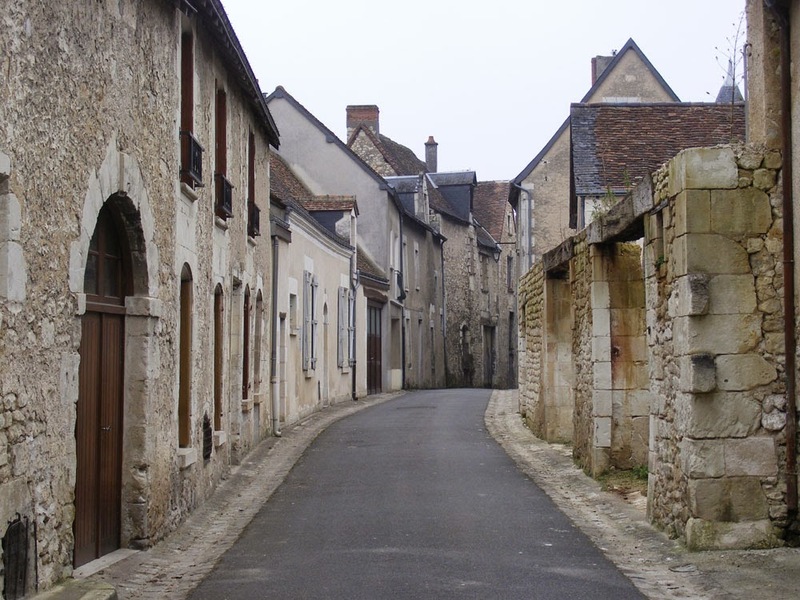 Chinon (7228), Loches (6400) and Saint Pierre des Corps (15 224) have also lost population. Despite the localised loss of people there is no slow down in the release of land for building and new homes going up in some areas. This is due to people choosing to live alone and families breaking up. On the up with populations increasing are Joué lès Tours (37 196), Montlouis (10 634) and Amboise (13 157). Sorigny is proportionally one of the biggest gainers, with 200 more people, taking advantage of the new exit from the A10. 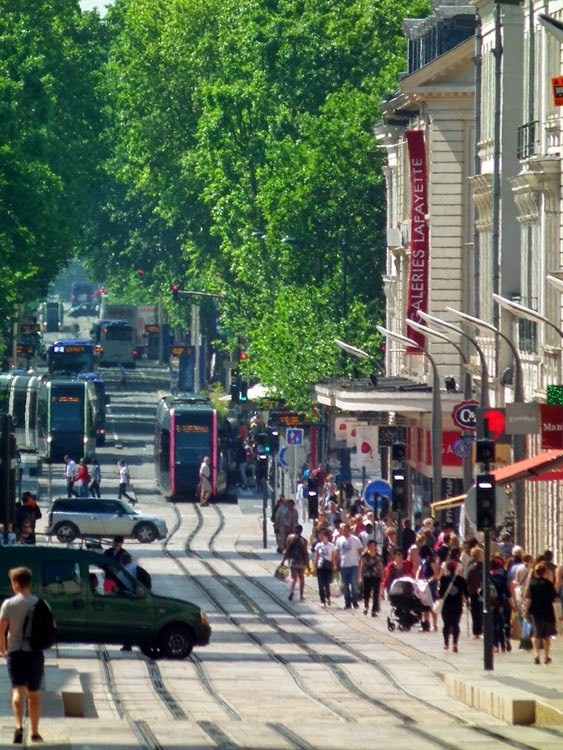 A typical scene on a boulevard in Tours. Tours is the largest town in the Centre region. The only other town with a population over 100 000 in the region is Orléans. After these two the largest towns are Bourges, Blois and Chateauroux. These last two have populations under 50 000. 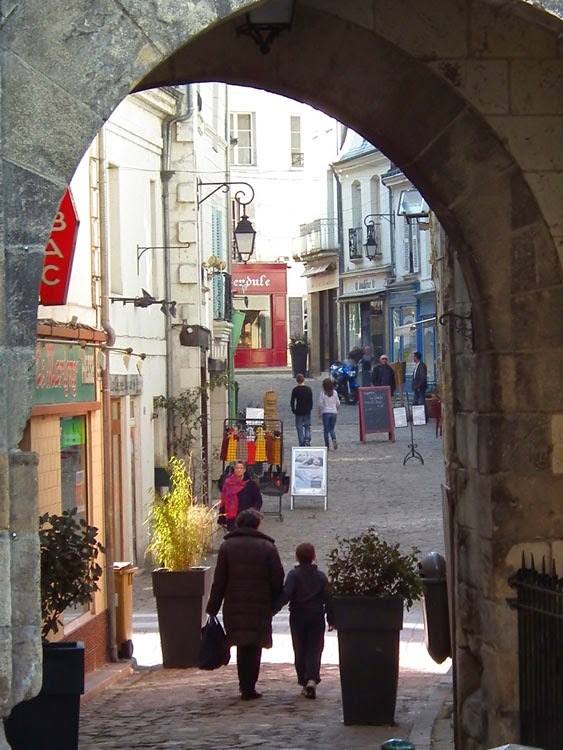 A typical scene in a small town on the tourist trail (Azay le Rideau). 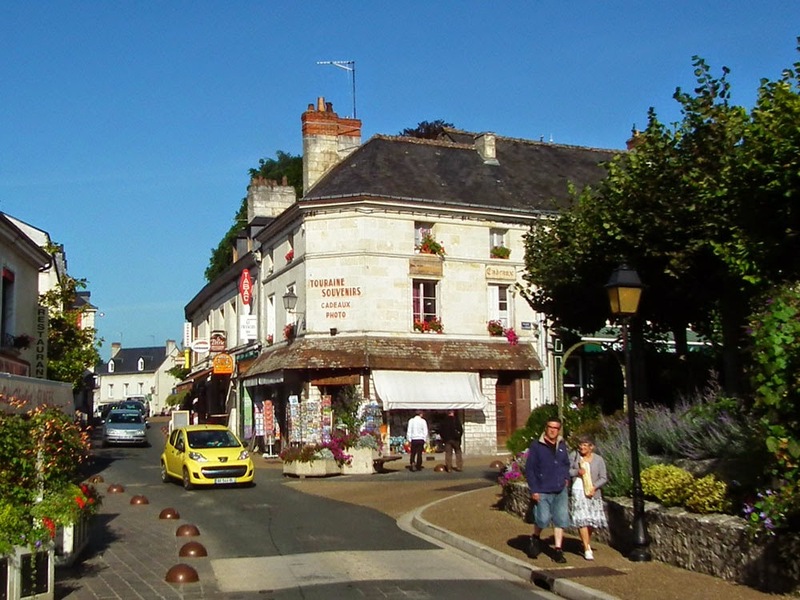 Indre et Loire is the second most populous department in the region, after Loiret. Loir et Cher is fourth and Indre the least populous. The population of France métropolitaine (ie France not including the overseas territories) is 63 375 971. Indre et Loire is more or less in the middle in terms of population compared to départements throughout France. A typical scene in a small town (Loches). The figures matter because government funding is largely dependent on population. Loire Valley Nature: A photo has been added to the Fly Orchid Ophrys insectifera entry. A section on insect hotels has been added to the entry on garden habitat. The text on maintaining an area of natural grassland has also been updated. A photo of cycling along a rural track has been added to the entry on walking trails. Cycling is permitted on the designated walking trails. A new entry has been added for Dainty Damselfly Coenagrion scitulum. Several new photos have been added to the Snakeshead Fritillary Fritillaria meleagris entry. A la cuisine hier: Quince Paste, fragrant and molten, made from quince pulp I put in the freezer after making quince jelly in the autumn. It occurred to me while I was making the paste that quince syllabub would be delicious. I must remember that for next quince season. Stir-fried turkey with vegetables, noodles and peanut sauce. 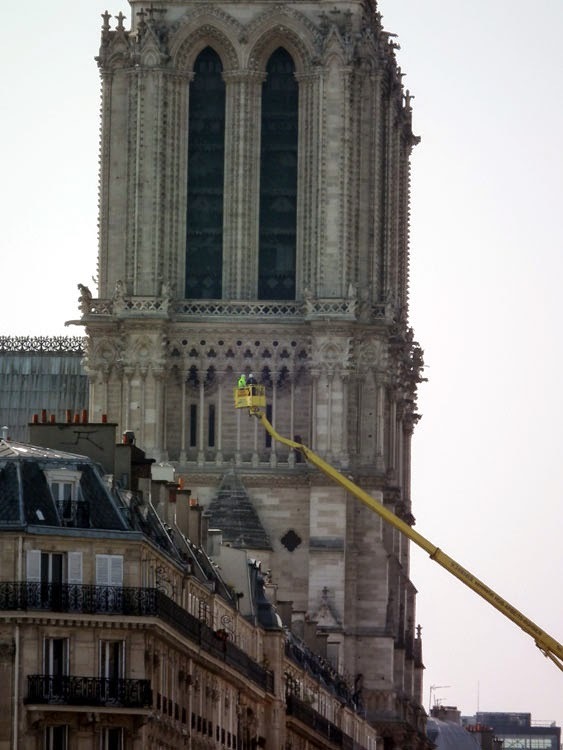 When we were in Paris in March 2014 we noticed some work being done on the West face of Notre Dame. They climb the tower and Quasimodo says that as the church is too mean to pay for ropes, ringing the bell involves taking a run up, leaping into the void, grabbing the clapper and slamming it into the bell before landing on the other side. He checks the clock, waits a couple of minutes, then says "like this". He takes a run up, throws himself at the bell and on the way past swings the clapper. On landing, he pirouettes, leaps again and the bell sounds. This he repeats until the bell has sounded twelve times. He then says "well - nothing to do for an hour, let's have lunch". After lunch Quasimodo says the the young chap "OK - show me what you got". The young man looks at the void, shuffles back to get a good run up, then leaps into action. He flings himself at the bell, but instead of grabbing the clapper he hits the bell with his head, then plummets to the ground. A couple of days later, there is a knock, and another man asks for the job. Once again Quasimodo is called from the tower, and told to show the young man what to do. Amazingly, exactly the same thing happens. As the priests are all standing around the Bishop asks "well - did anyone ask this man his name?" And Quasimodo says "No - but he is a dead ringer for the other bloke". No-one says that reading a blog should be pain free. A Film to Watch: In these dark days of prejudice and hate a sleeper of a film is suddenly taking off. I haven't seen it yet, but reviews of Les Heritiers (known as Once in a Lifetime in English) are saying people are turning to it as an offering of hope. It's based on a true story about a class of underprivileged multi racial school kids who win a history prize with a project about the Holocaust. One of the kids plays himself and helped write the script. The film is no doubt full of clichés, but the real project changed lives and attitudes at least on a local scale. It reminds me of the time I went to the Building Exploratory in Hackney, an area of London which corresponds quite well to the area Les Heritiers is set in. The curator showed us maps of the area from different periods. He said the one which made the most impact on the local kids was the one which showed the extent of bombing in World War II. Many of the local residents come from war zones and were immediately engaged by the story the map told them. They knew what living in a war zone was like, but had no idea until that moment that their elderly white neighbours also knew. Another feel good film has been a box office success in the New Year period too. It is coming to Preuilly but we are not planning to see it. La Famille Bélier is about a deaf girl who becomes a singer. Unfortunately, none of the actors are deaf in real life, the sign language used in the film is just nonsense gestures and 'deaf person discovers music' is a fairly tired meme. As a deaf reviewer pointed out, actually, even though the hearing world seems to spend its entire time plugged in to ipods like life support machines, for most people who have been deaf from birth, music is neither here nor there and they are not feeling their lives are any the poorer for it. Loire Valley Nature: A photo has been added to the Small Rivers habitat entry. A photo has been added to the Cowslip Primula veris entry. A new entry has been added for Crested Cow-wheat Melampyrum cristatum. Two photos have been added to the Big Rivers habitat entry. An amusing photo of couples in tandem egg laying has been added to the Blue Featherleg Platycnemis pennipes entry. A new entry has been added for European Cuckoo Cuculus canorus. Two photos have been added to the Ivy-leaved Cyclamen Cyclamen hederifolium entry. A photo of flower rich grassland has been added to the entry for Dry Limestone Ridges. A la cuisine hier: Gingernuts, spicy and crisp with coffee. 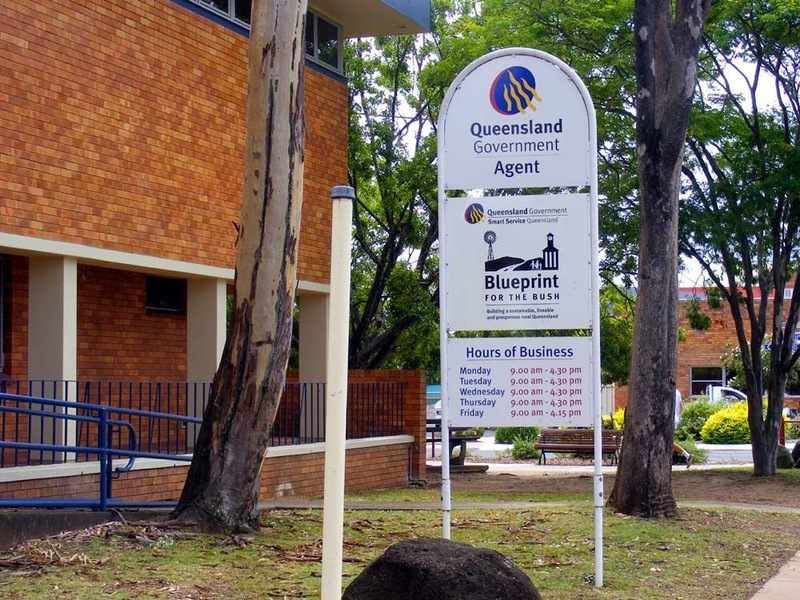 Above, the State Government offices in the small Australian town where I grew up. The tier of government below this is the Regional Council, the tier above is the Federal (national) Government. 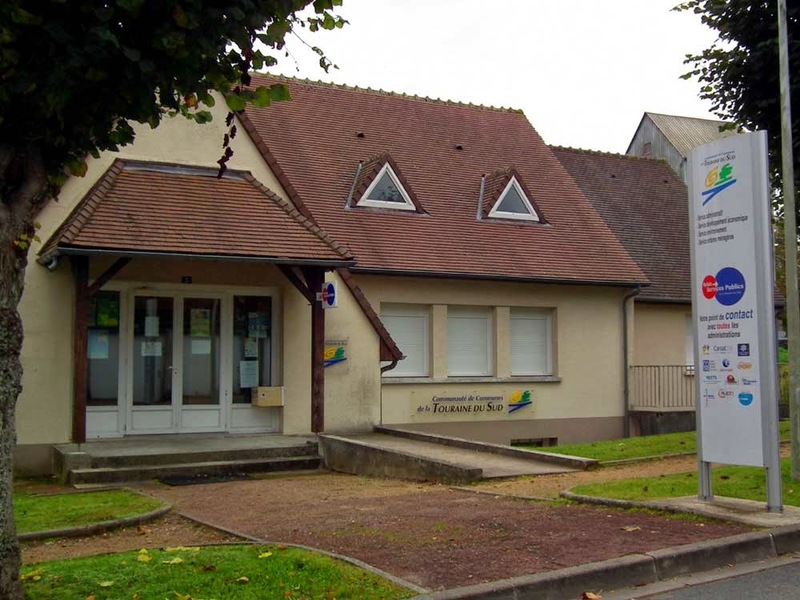 Below, the Communauté de Communes de la Touraine du Sud offices in Preuilly. The Communauté de communes is a group of small local authorities that work together so they form a larger entity and can achieve economies of scale. The tier below this is the individual communes, the tier above is the Conseil Générale (the equivalent of the Regional Council). A la cuisine hier: Cream of Celeriac Soup, made by processing leftover céleri rave et poireaux à la boulangère with more chicken stock and some blue cheese. One of those cases where the leftovers were better than the original dish. Popcorn, just for snacking fun. Chicken thighs marinated in a lemony mix and baked along with potato wedges. Coupe Mont Blanc, the world's richest dessert. Loire Valley Nature: A new entry has been added for Clustered Bellflower Campanula glomerata. A habitat photo has been added to the Snakeshead Fritillary Fritillaria meleagris entry. A photo of Christian taking a moss sample has been added to the Resources entry. A photo of Tropinota sp has been added to the Chafer Beetle entry. 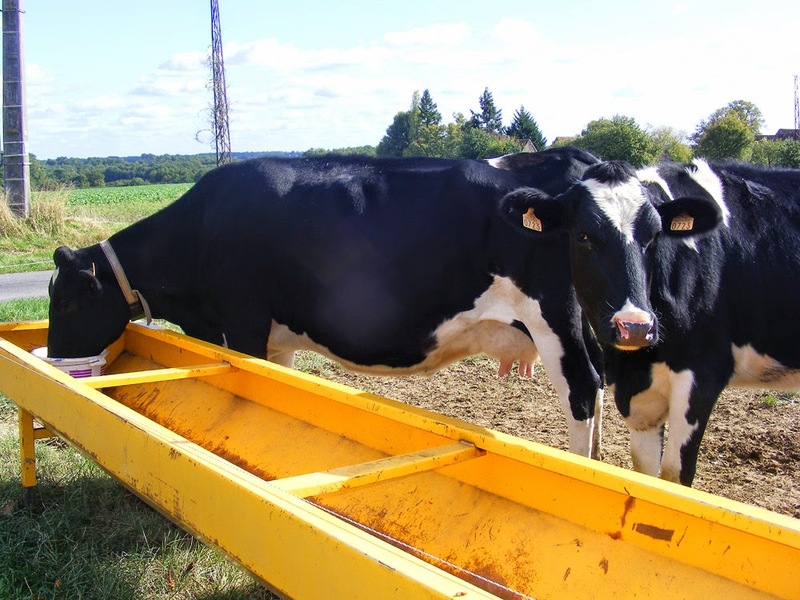 The latest issue of C'est en Touraine, the magazine of the Conseil Général d'Indre et Loire, has arrived in our letterbox and in it is an article about the dairy factory at Verneuil sur Indre. It contains all sorts of facts and figures so I thought I would inflict them upon our readers. Holstein Friesian dairy cows, near Charnizay. 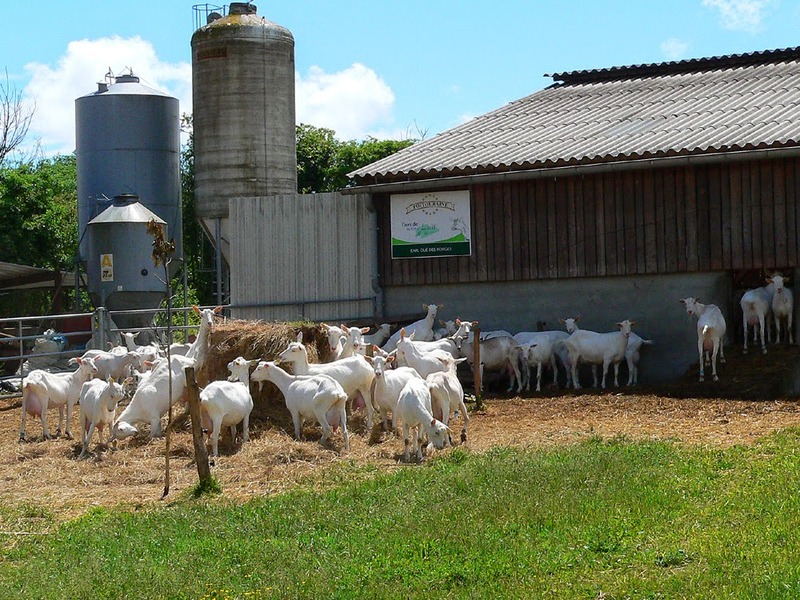 Dairy goats (for illustrative purposes only -- I don't think this farm is in the co-operative supplying the factory). Photo courtesy of my Dad. The factory now boasts a giant butter making machine, with a capacity for producing 800 kg batches of butter (2100 litres of cream yields one tonne of butter). Depending on who the butter is destined for it can be cut into 5, 10 or 25 kg blocks as an ingredient for other food manufacturers. They also produce 33 million 250 g blocks for the supermarket shelves. In the spring the butter is fruitier and easier to spread. In the winter it is drier and sought after by pastry chefs. They buy it up and stock their freezers. 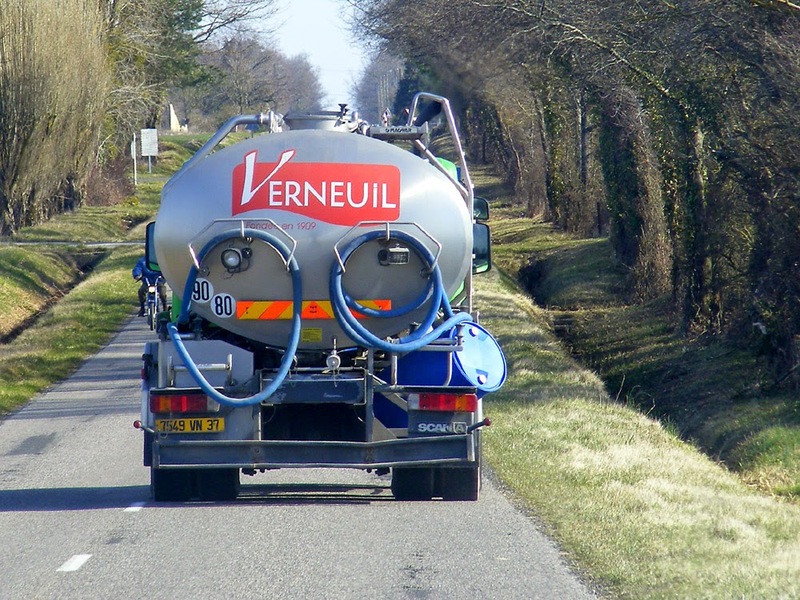 Following the milk tanker, heading towards the factory. The milk collected the day before is skimmed and pasturised. The cream is taken off using a centrifugal separator and a lactic culture is added. It's allowed to mature for 18 hours in a special vat. The following morning it's pumped into the butter making machine in the next room. From 5 am to midday a team of 6 people make sure this traditional process goes off without a hitch. 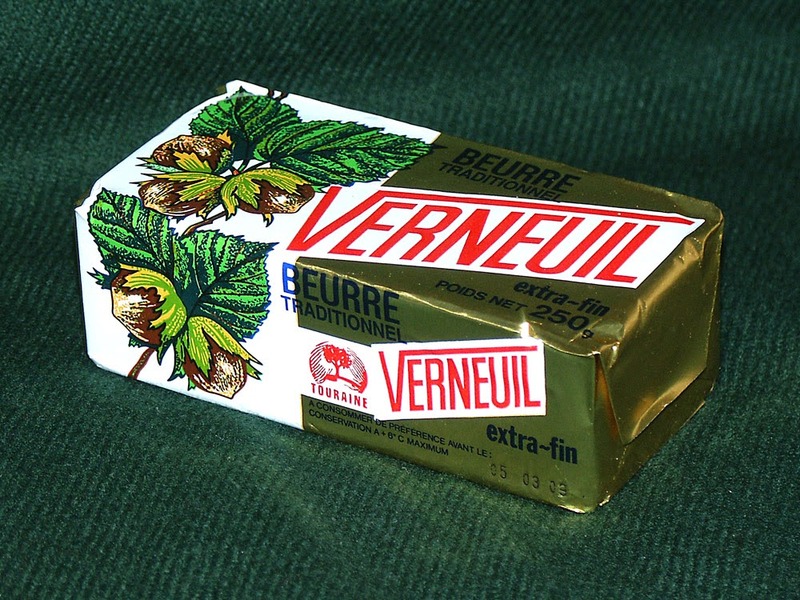 A 250 g block of Verneuil butter. From 8 to 10 tonnes of butter comes out of the butter making machine daily. The fat content is compressed by a wormscrew then pushed towards the processing line. It is cut and boxed for the food professionals and each box is weighed manually. The cutting and wrapping of 250 g blocks is done on another line in parallel. Between 50 and 60 tonnes of salted butter roll off the conveyor belt each year. Blois is somewhere we drove through many times before we moved to France, as it's on the road to the Paris airports. The chateau sits in the middle of town. It was purchased by Louis d'Orléans, brother of mad Charles VI, at the end of the 14th century under somewhat scandalous circumstances when he seduced the young wife of the previous owner. His son Charles inherited, but taken prisoner at the battle of Agincourt, he was held in captivity for 25 years. 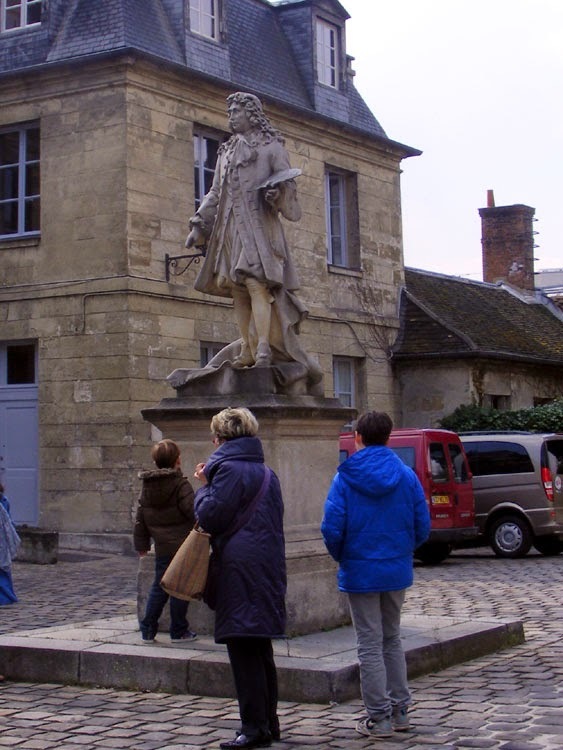 Finally in 1440 he was able to return to Blois, which became his favourite residence. 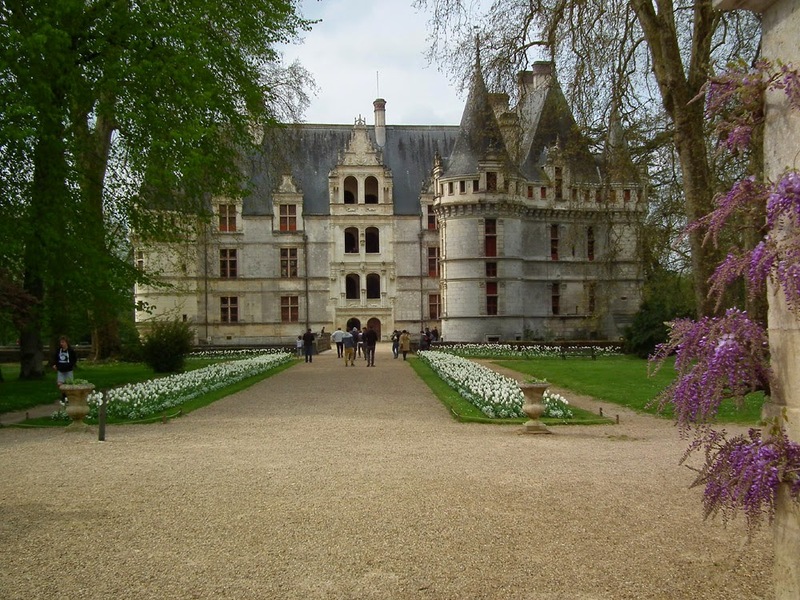 He spent the next 30 years writing poetry and rebuilding the chateau, a reaction to the end of the Hundred Years War that was not untypical of his class. Then to everyone's amazement, he fathered a son and heir at the age of 71. The son, through the death of his childless cousin Charles VIII, became King Louis XII and married his cousin's widow, Anne of Brittany. 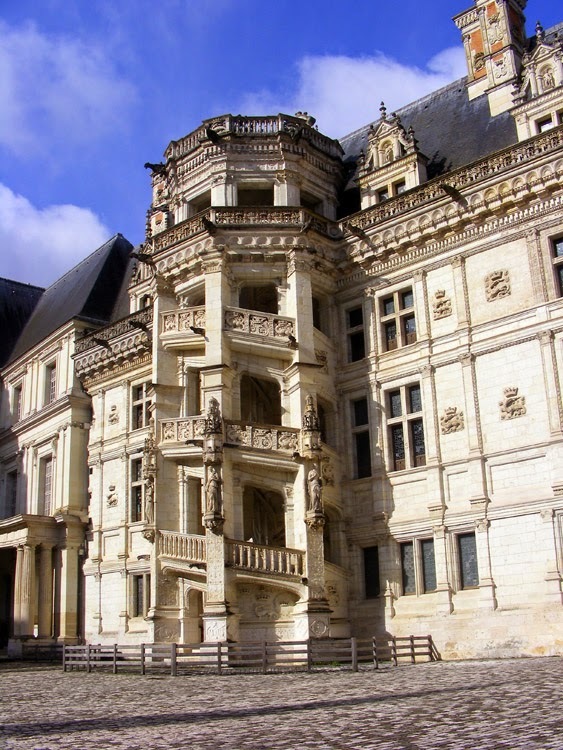 Blois became the principle royal residence and the couple built a new wing and enlarged the gardens. Their daughter Claude, the next queen, was raised in the chateau and died there at the age of 25, worn out after giving François I seven children in 8 years. 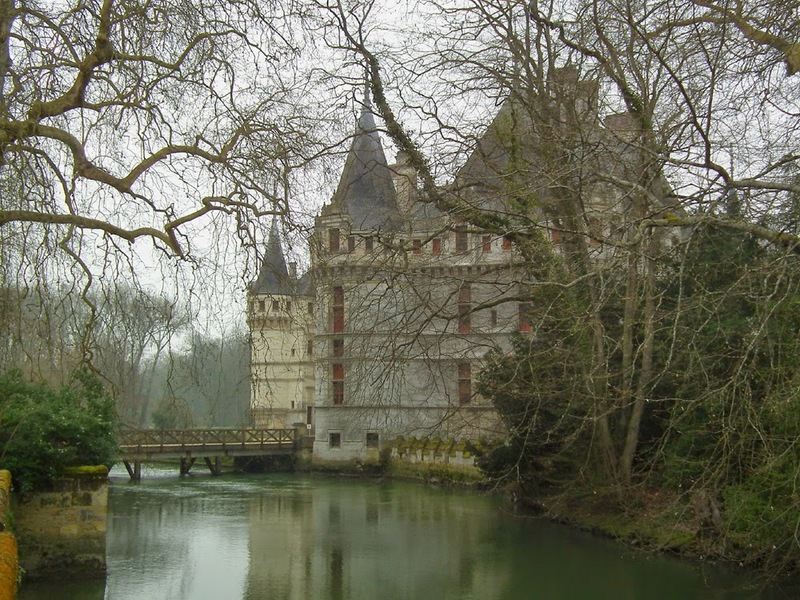 François added the most beautiful wing of the chateau and it became the model for subsequent Renaissance chateaux up and down the Loire. Claude and François' politically inept grandson Henri III thought to sort out his troublesome rival, the charismatic Duke de Guise, by having him assassinated here in 1588. Soon afterwards Henri's mother, that tough old cookie Catherine de Medici died at the age of 69 in her apartment in the chateau. Twenty-eight years later, the dowager queen Marie de Medici was banished to the chateau by her son Louis XIII, at the end of his tether dealing with her endless scheming. After this he gave the chateau to his equally scheming brother Gaston d'Orléans, in the hopes of repairing family relations. Gaston employed the architect Mansart to build a whole new wing but his grandiose plans were ended with the birth of the future Louis XIV and Richelieu cut off funds to the now 'obsolete' prince. Gaston had expected to be king after his hitherto childless brother, but the surprise new infant put a stop to that. In the 18th century the chateau was abandoned, and there was even talk of demolishing it in the early 19th century. 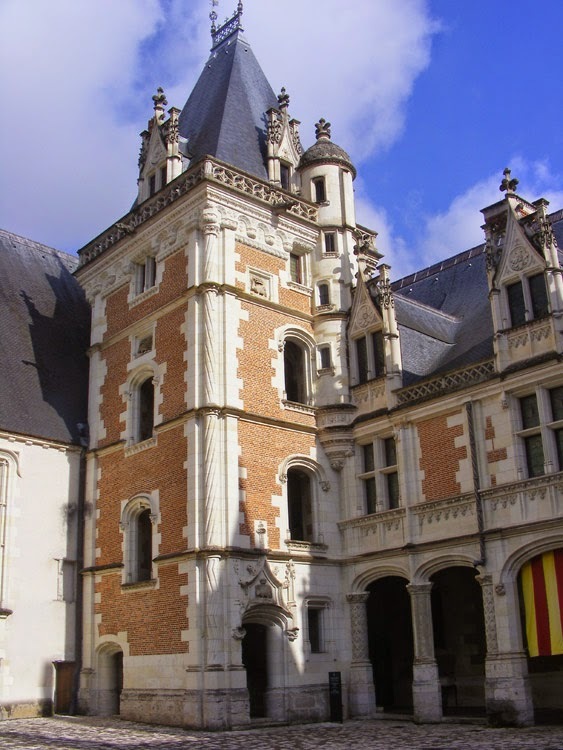 Luckily, instead, it was given to the town of Blois and used as military barracks. The soldiers were surprisingly gentle tenants and the building was not significantly altered. Eventually a tide of Romaticism washed over the country and in the middle of the 19th century interest in the medieval and renaissance was at an all time high. Architects and masons were engaged for over 50 years on a restoration project. During the early days of World War II, Blois, like every other town with a bridge over the Loire, saw a flood of people fleeing to the south to escape the German invasion. In June 1940 the town was bombed by the Germans and several fires started. The chateau was threatened and in order to protect it two grand neighbouring 15th century houses were deliberately blown up to halt the spread of the fire. The staircase tower in the inner courtyard at the end of the Louis XII wing. 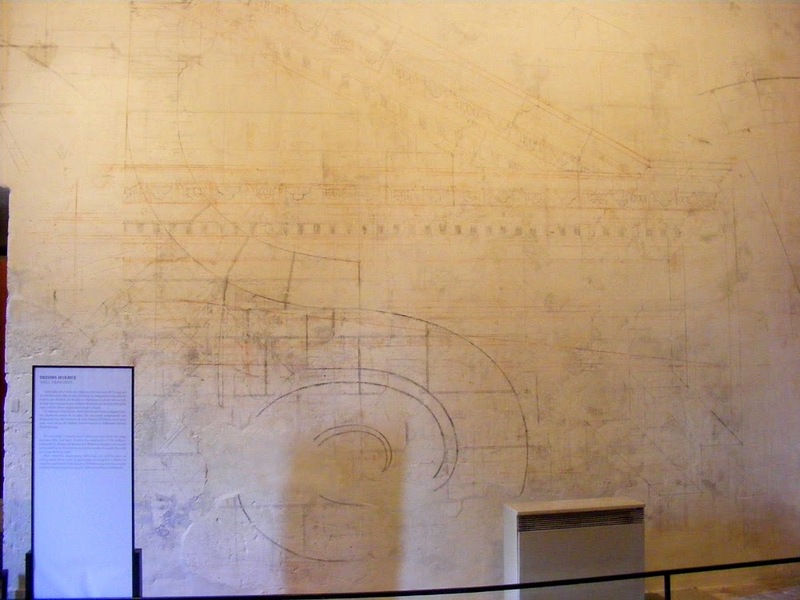 Masons' drawings from the end of the 19th, beginning of the 20th centuries, done directly on an internal wall during a period of major restoration. 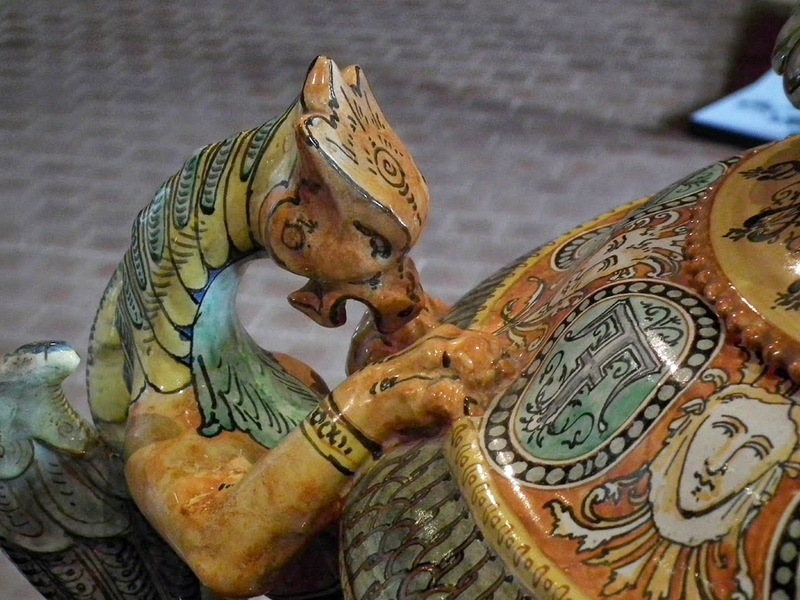 Detail of a 1873 majolica urn by Ulysse Besnard in the Musée de Beaux Arts section of the chateau. Besnard was the curator of the chateau and led a revival in the renaissance art of faience and maiolica (tin and lead glazed earthenware). The rather unusual symbol represents both his claim on Milan (who also used the porcupine) and his ability to aggressively defend himself 'both near and far' (because of the porcupine's supposed ability to project its quills). The staircase in the François I wing. 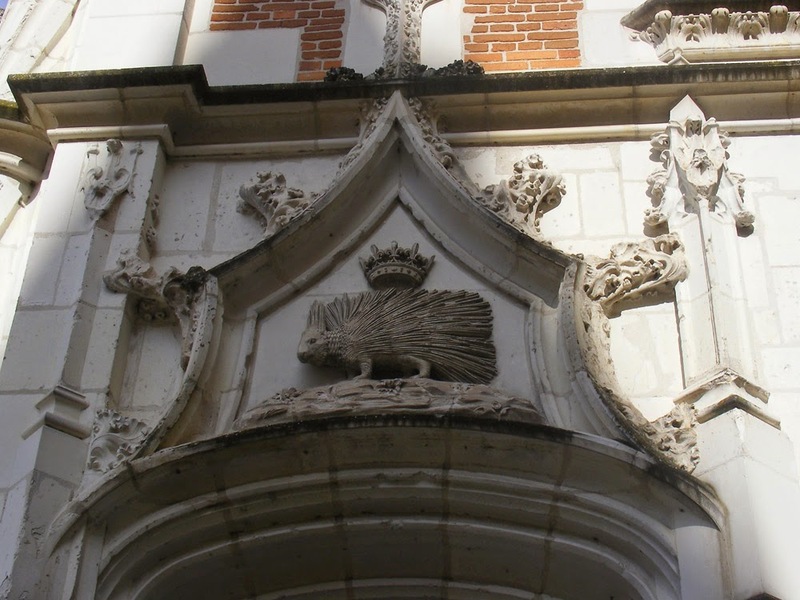 The external walls of the apartments are decorated with Francois' emblem, the salamander, another unusual choice of symbol, representing François' ability to 'survive the fire unscathed'. 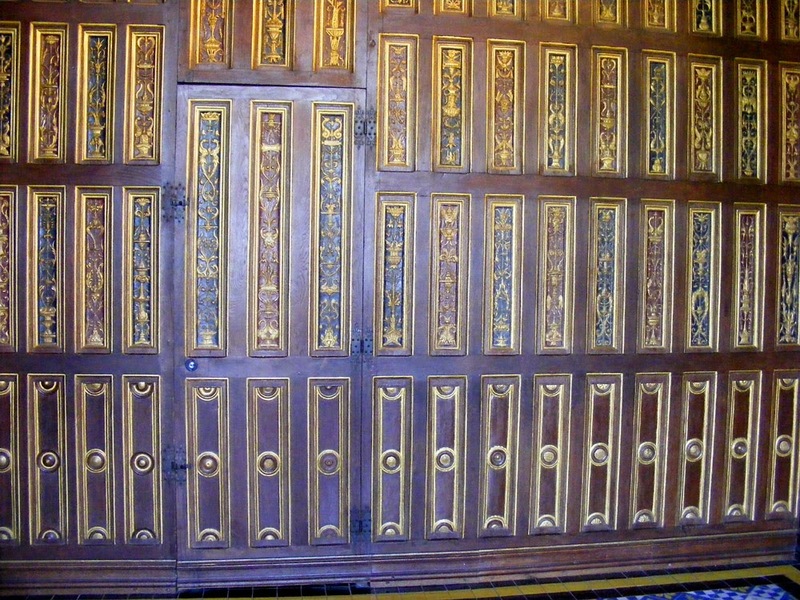 The panelling in the private study built by François I. This room would have been used for reading, dealing with correspondence, creative writing such as poetry, contemplation, and housing collections of curiosities. The panelling would not have looked like this in Renaissance times. Within months of its construction smoke from the open fire and candles would have dulled the gilding and blackened the wood. After his death, his daughter in law Catherine de Medici used the study. This year there will be an exciting special temporary exhibition at the chateau from 5 July to 18 October. Called Royal Treasures from the Library of François I, to celebrate the 500th anniversary of his accession to the throne at the age of 20. Most of the objects will be on loan from the National Library of France and will include his mother in law Anne of Britanny's Book of Hours (a 19th century facsimile is permanently on show at the Logis Royal in Loches). It's a chance to see extraordinary things that are rarely exhibited.